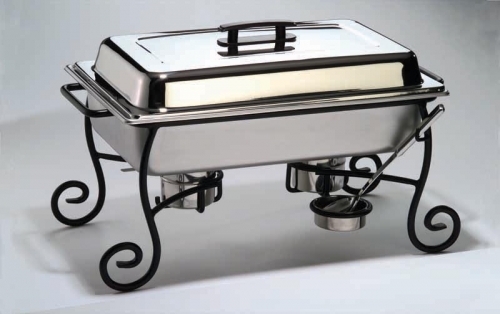 Lend a different look to your buffet line with this chafer featuring a beautiful black wrought iron stand. Welded chafer frame constructed from heavy-gauge wire. Frame contains two slots for fuel holders, a serving spoon cup, and accommodates standard full-size water and food pans. Convenient side handles on frame allow easy transport. Set includes frame w/spoon cup, water pan, lid, and 2 fuel holders.